Forages are a major feed component for the cow-calf and backgrounding sectors of the beef industry. There is considerable room for improving beef production from pastures and stored forages. Appropriately managed pasture with a significant legume component is inherently one of the most sustainable feed sources for cattle. Forage species have different yield potential and nutritional quality, which can influence the productivity of beef cattle in pasture. Little research has been done to determine which forage species combinations have the greatest potential to improve beef production from forages. To identify forage species mixtures that provide the best opportunity to enhance beef productivity both on pasture and with stored forages. This research continued work initiated under the first Beef Cluster (FRG.07.10). Previously established plots were evaluated for an additional three years. Experiment 1 - Binary Mixtures: One grass and one legume were used in the mixtures for this study. Grass species included timothy, Kentucky bluegrass, tall fescue, meadow fescue, orchardgrass, and meadow bromegrass cross seeded with white clover, trefoil, and grazing type alfalfa. Each grass species was subdivided into a set of one (Levis and Normandin Quebec sites) or three (Nappan) cultivars from the recommended list. In Quebec, grazing was simulated. At Nappan, mob grazing with beef cattle was used. Agronomic performance and herbage quality data from five production years (2011 to 2015) were collected. Herbage samples were taken just prior to the beginning of each grazing cycle and processed to assess nutritional quality. Experiment 2 - Complex Mixtures: Agronomic and animal performance data (Nappan only) were collected during 5 production years (2011-2015). Four grass mixtures were cross seeded with one of two legumes (trefoil and grazing type alfalfa). Grass species include: 1) timothy, meadow fescue, reed canarygrass, and Kentucky bluegrass; 2) Kentucky bluegrass, tall fescue, orchardgrass, and meadow bromegrass; 3) meadow fescue, timothy, Kentucky bluegrass and; 4) reed canary grass, Kentucky bluegrass, tall fescue, and meadow bromegrass. Plots were rotationally grazed (Nappan) from May to October. 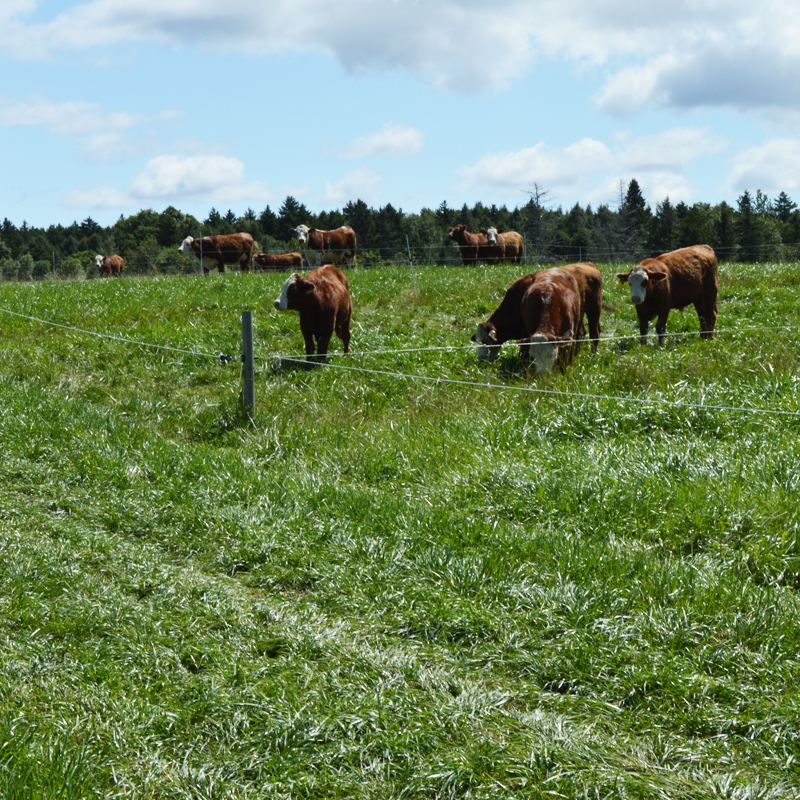 Simulated grazing (clipping) was utilized in both Quebec sites (Levis and Normandin). Herbage samples were taken just prior to the beginning of each grazing cycle. Samples from the second and last grazing cycles of each year were processed to assess nutritional quality and botanical composition. Experiment 3 - Nitrogen Fertility for Complex Mixtures: This study was conducted at three sites in eastern Canada (Nappan, NS; Normandin, QC; New Liskeard, ON) that differ microclimatically from one another. Mob grazing was used at all three sites. Four complex mixtures, under three N rates (0, 60, and 120 kg N/ha/year), were evaluated. Half of the N was applied in the spring and the second half after the second grazing. Ammonium nitrate was used as the N source at Nappan and New Liskeard, while calcium ammonium nitrate was used at Normandin. Researchers compared mixes with poor regrowth/poor tolerance to frequent defoliation (timothy and meadow fescue) or good regrowth/good tolerance to frequent defoliation (tall fescue and meadow brome grass). The four complex forage mixtures included: 1) Alfalfa + (timothy, meadow fescue, reed canary grass, Kentucky bluegrass); 2) Alfalfa + (tall fescue, meadow brome grass, reed canary grass, Kentucky bluegrass); 3) birdsfoot trefoil + (timothy, meadow fescue, reed canary grass, Kentucky bluegrass); and 4) Birdsfoot trefoil + (tall fescue, meadow brome grass, reed canary grass, Kentucky bluegrass). Experiment 1: The grass species in mixtures with all legumes persisted well under frequent cutting or rotational grazing but their performance varied with sites. White clover grown with any grass species did not perform well under frequent cutting or rotational grazing. At all trial sites meadow bromegrass-based binary mixtures had the greatest yield with alfalfa or birdsfoot trefoil. Legume, grass species, and grass cultivars in the mixture significantly affected annual yield. White clover binary mixtures had the greatest seeded legume plant counts over the four years, but showed the least legume contribution to yield. The choice of grass species, grass cultivars, and legume species in binary grass-legume mixtures affect forage yield and the survival of grass plants in grazed swards. Experiment 2: Cattle grazing trefoil pastures had over 40% greater animal gain per hectare than cattle grazing alfalfa-based pastures. Cattle grazing trefoil pastures also had a slightly higher average daily gain. This was despite higher dry matter yields, TDN, and CP levels in the alfalfa pastures. The trefoil pastures showed higher water-soluble carbohydrates and WSC/CP ratio. Pasture mixtures containing timothy showed greater animal daily weight gains than those containing tall fescue. Agronomic results for the complex mixtures from across all sites showed significant grass mixture by legume by site interactions. In general, the sites in Quebec showed a greater drop in dry matter yield over the 5 years compared to the Nappan site, likely due to the nutrient cycling associated with the cattle grazing the Nappan site. In all sites, the legume levels declined over the years this was greater at the Nappan site, likely due to selective grazing by the cattle. Experiment 3: In general, increasing N fertilization of complex mixtures did not increase the seasonal forage dry matter (DM) yield at any of the sites in the first post-seeding year but generally increased the seasonal DM yield in the second and third post-seeding years. Nitrogen fertilization increased the N concentration of the forage. The legume species (alfalfa and birdsfoot trefoil) affected seasonal DM yield and some nutritive attributes only in the first post-seeding year. The low contribution to DM yield of the two-legume species in the second and third post-seeding years explains the lack of an effect of legume species on most attributes. This suggests that for pasture situations where individual animal performance is a priority, timothy and meadow fescue with trefoil would be desirable; if overall gain per hectare is the primary need for a larger number of cattle with lower production expectations, tall fescue based pastures may be more suitable. Some species, and in particular cultivars within species, will give greater yield and nutritional quality. Although several grass species cultivar/legume combinations stand out, from a national perspective these results demonstrate that evaluating species and cultivars under grazing systems would benefit the beef industry.